The Department of Defense on Saturday identified the two soldiers who died Friday in Kunduz Province, Afghanistan, as a result of wounds sustained while engaged in combat operations. Spc. Joseph P. Collette, 29, of Lancaster, Ohio, was assigned to the 242nd Ordnance Battalion, 71st Explosive Ordnance Disposal Group, out of Fort Carson, Colorado. Sgt. 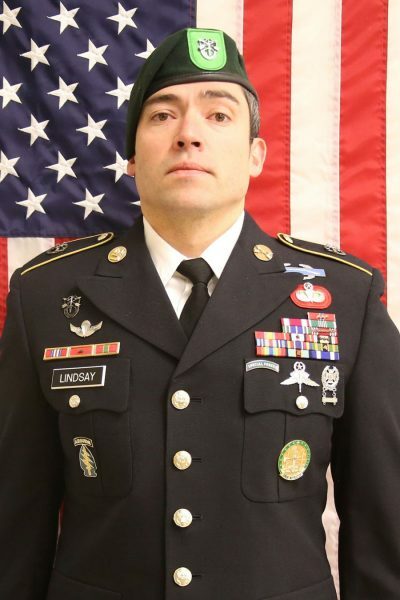 1st Class Will D. Lindsay, 33, of Cortez, Colorado, was assigned to 2nd Battalion, 10th Special Forces Group (Airborne), Fort Carson, Colorado. The couple married several months ago, before Joey Collette’s first overseas deployment to Afghanistan. They were waiting to have a proper wedding ceremony, and possibly children together, when he returned to the United States this summer. Each has two children from previous relationships. On Friday, Caela Collette learned that those plans would never materialize, when she was told her husband was killed in combat earlier that day. The two deaths announced Friday come as Washington continues direct talks with the Taliban aimed at ending the U.S.’s longest war — now in its 18th year. The latest deaths raise the toll to four American troops killed in Afghanistan this year. On Facebook, Collette posted what she said was her husband’s favorite photo. 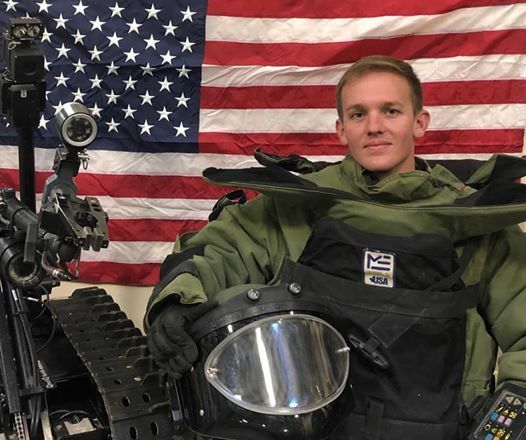 In it, decked out in his bomb disposal suit in front of an American flag and flanked by a bomb disposal robot, Joey Collette smiles and points jocularly at the camera. In the comments, she said she waited until all of his friends and family had been notified of his death before posting. The Lancaster, Ohio-native’s stepfather, Jim Wickline, also confirmed his death to the Lancaster Eagle-Gazette. His full name is Joseph Peter Collette and he was a corporal, Wickline told the newspaper. His stepson had joined the Army after graduating from Lancaster High School in 2007. Columbus’ 10TV reported that Joey Collette was a specialist and had been attached to a Special Forces unit in Afghanistan. On Facebook, members of the EOD community swapped out their profile photos for an image of an EOD badge with a black band across it. In posts and comments, many wrote, “We remember.” Some mentioned that they had served with Joey Collette at the Fort Carson, Colo.-based 62nd Ordnance Company. Facebook user David Guyette, whose profile says he’s an explosives expert, posted the same photo Caela Marie Collette had used. “You were a dope little team member, and an awesome dude,” Guyette said. Several Facebook users had begun changing their profile photos to images of the Special Forces beret flash crossed with a black or green band. A religious ministry in the Fort Carson area posted one such photo on Saturday. “Hearts broken for our 10th Group family,” Military Ministry of Woodmen Valley Chapel of Colorado Springs, Colo., wrote in a message accompanying the photo. 10th Special Forces Group (Airborne) is based at nearby Fort Carson. Lindsay enlisted in the Army in July 2004 and completed One Station Unit Training and Basic Airborne School at Fort Benning, Ga., before completing the Special Forces Qualification Course and getting assigned to 10th Group in July 2006, Lt. Col. Loren Bymer, U.S. Army Special Operations Command spokesman, said in a statement. He deployed five times to Iraq, to Tajikistan in 2016 and to Afghanistan. Lindsay’s awards and decorations include the Bronze Star Medal with four oak leaf clusters, Purple Heart Medal, Meritorious Service Medal with one oak leaf cluster, Army Good Conduct Medal with three oak leaf clusters, National Defense Service Medal, Global War on Terrorism Service Medal, Combat Infantryman Badge, Military Free Fall Jumpmaster Badge, Master Parachutist Badge, Chilean Airborne Wings and Senior Instructor Badge. Collette joined the Army in 2010 and his awards and decorations include a Purple Heart, Combat Action Badge and Senior Explosive Ordnance Disposal Badge, Fort Carson said in a statement. “The 71st Ordnance Group (EOD) is deeply saddened by the loss of Spc. Joseph P. Collette. We extend our deepest sympathies and condolences to his Family and friends,” Col. David K. Green, the unit’s commander, said in a statement. Wickline said Collette’s remains will arrive at Dover Air Force Base, Del., and then will arrive at Rickenbacker International Airport in Columbus, Ohio, probably on Sunday, to be followed by a procession to a local funeral home at an undetermined time. Lancaster is about 33 miles south of Columbus. The Lancaster Fire Department will be a part of the procession, Assistant Chief K.J. Watts told the local paper, but he did not yet know the time of the event. The procession could be later in the week, he said. Joey and Caela Collette were married in December. Joey Collette and Lindsay were the third and fourth U.S. troops killed in the country this year. Few details of the operation they were killed on have been revealed, though the Taliban and an unnamed military official have said it occurred in the northern province of Kunduz. News of the latest American deaths came nearly two weeks after the most recent round of direct negotiations between U.S. and Taliban officials wrapped up in Doha after nearly a fortnight, with both sides saying progress had been made. The discussions resulted in two draft agreements on a “withdrawal timeline (for U.S. forces) and effective counterterrorism measures,” Washington’s chief negotiator at the talks, Zalmay Khalilzad, said on Twitter. But as the negotiations continue, so, too, do U.S. and Taliban military operations throughout the country. Afghan troops backed by U.S. forces recently began military operations against insurgents in Kunduz province, a hotbed of Taliban activity, provincial council member Aminullah Ayedin told Stars and Stripes. Scores of insurgents have been killed in the operations, as have more than a dozen civilians, Ayedin said. The civilian deaths prompted demonstrations on Saturday, during which participants carried the remains of their loved ones through the streets. Photos of the protest appeared to show the bodies of 12 people, including five or six children, the Associated Press reported. Relatively few of the roughly 14,000 U.S. troops deployed to Afghanistan go into combat or serve near the front lines, as they assist NATO’s training and advising mission. However, some assist a separate U.S. counterterrorism mission that targets groups like al-Qaida and the local Islamic State affiliate. In January, Army Ranger Sgt. Cameron Meddock, 26, and Green Beret Sgt. 1st Class Joshua “Zach” Beale, 32, died in separate incidents. Last year, 13 Americans were killed in combat in the country and two others died in noncombat incidents. Since 2001, more than 2,400 American troops have been killed in Afghanistan. More than 20,000 have been wounded since the beginning of the war.